Are whale sharks in trouble? Whale sharks (Rhincodon typus, Figure 1) are the largest fish in the sea (12 meters or 40 feet). Easy to spot you think! In reality, because they spend most of their life in the open or deep ocean they are difficult to observe and basic aspects of their biology and ecology are still unknown. These charismatic sharks categorized as “Vulnerable to Extinction” are highly susceptible to overexploitation largely because of their slow growth and late maturation. Their tendency to aggregate near tropical and subtropical coasts owing to seasonal availability in food makes them an easy and very lucrative target for fishers. 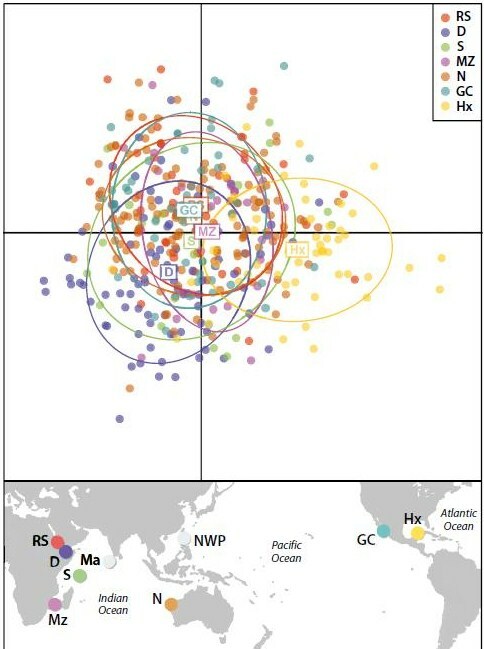 To estimate the genetic diversity and understand patterns of connectivity of whale shark populations, Vignaud and collaborators (2014) collected DNA from 635 individuals (mostly from skin samples) in the Indian, Pacific and Atlantic Oceans and they also used data already published for 68 individuals (Figure 2). For this study, two types of DNA markers were used: microsatellites and mtDNA. Of all the sampled locations, individuals from Isla Holbox Ocean had the lowest genetic diversity. The greater genetic differences were seen when comparing Isla Holbox in the Atlantic with all the other sites from Indo-Pacific (as you can see in Figure 2, the ellipses of the cloud of points from Isla Holbox in yellow are clearly most different from the other sites). This suggests that whale sharks exist in two distinct populations in the Indo-Pacific and the Atlantic Ocean. Previous studies suggest that whale sharks first appear in the fossil record at least 30 million years ago and they most likely formed a single population that was divided when the Isthmus of Panama closed during the Pliocene epoch. The data of the present study suggests that mixing between the Indian and Atlantic was and is rare. There is also the possibility that more populations exist (because there are still areas that have not been sampled) therefore more comprehensive sampling and techniques may disclose this. Figure 2: Scatter plot from a discriminant analysis of principal components using microsatellite DNA. Dots represent individuals from seven locations. Sampling locations are: RS – Red Sea; D – Djibouti; S – Seychelles; Mz – Mozambique; N – Ningaloo; GC – Gulf of California; Hx – Isla Holbox. Only mtDNA was available for Maldives (Ma) and Northwest Pacific (NWP). Additionally, the authors found evidences of a population expansion (a few hundred generations ago) that possibly coincides with the early Holocene (approximately 7000–11 000 years ago). 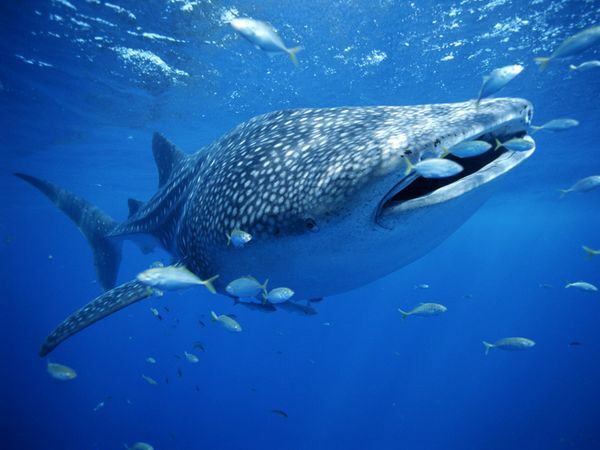 During this period, the rise in sea levels increased the oceanic surface and consequently plankton productivity, which would increase the number of whale shark populations as indicated by both types of DNA markers. Vignaud and collaborators (2014) also found that for the Ningaloo Reef in Western Australia the effective population might have declined in recent decades. They documented decreases in genetic diversity for five consecutive years (2007–2012). This time period coincides with the heavily exploitation of whale sharks in India and Asia. However, whether this decline in diversity is real is unknown since there are several explanations for the observed declines such as regular change in breeding location. Further research is needed but the results are certainly concerning in terms of evidence that whale sharks need to be conserved at multiple spatial scales.